As be begins his second decade as governor, Rick Perry's plan is to deal with the basics: to make sure the state is on a smooth economic path, to pass a balanced state budget, to coax the federal government into loosening its purse strings and tightening its security on the Mexican border. On the eve of his inauguration — and the beginning of his second decade as governor of Texas — Rick Perry's goals don't turn on new initiatives. He doesn't want to change the world, in the way that a new officeholder might. Instead his plans for the session are to deal with the basics: making sure the state is on a smooth economic path, passing a balanced state budget with no new taxes or new revenue measures, coaxing the federal government into loosening its purse strings and tightening its security on the Mexican border, allowing Texas police to check the immigration status of people they suspect are in the country illegally, and getting it all done with no special sessions next summer. Oh, and he's been talking to California Gov. Jerry Brown, a Democrat, to trade ideas about Medicaid and other federal programs. This is the same Texas governor who made a point of not walking in sync with Brown's predecessor, Republican movie star Arnold Schwarzenegger. "Keeping Texas on track is the most important thing that I'm going to do, and that's actually what we talked about during the campaign," Perry said in an interview with The Texas Tribune late Monday afternoon. 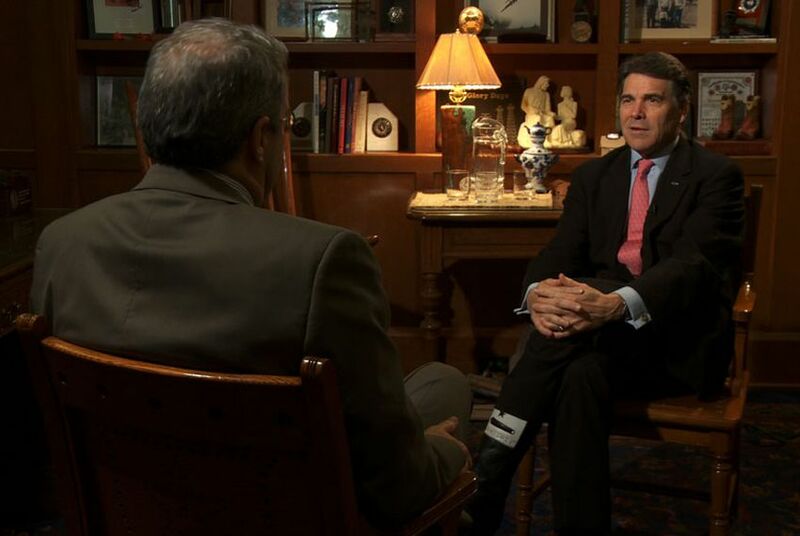 Perry's beef with the federal government was marbled throughout the conversation about the state budget and immigration. He wants to avoid a legislative wrestling match over immigration and said the state's duties pale next to those of the feds. "We as a state can put our police forces, our Texas Rangers, our parks and wildlife wardens, coordinating with the Border Patrol and with the local sheriffs' and police departments, and that's not going to be enough. We have to have the federal government's full engagement and that means substantially more law enforcement uniforms, law enforcement on the ground on that border," Perry said, mentioning 3,000 additional officers and more technology as a starting point. "Until you do that, having these long and rancorous discussions is kind of a waste of time," he said. "We're going to have a number of pieces of legislation that are filed, from Arizona-style legislation to you-name it will probably be introduced. But the fact is, none of it really matters in the grand scheme of things, relative to the importance of securing the border." That said, he's put a ban on sanctuary cities on his emergency list of items lawmakers can consider during the first 60 days of the session. "It does matter that we do away with sanctuary cities." He said the difference between Houston, Arizona and the Texas Department of Public Safety is that Houston bars officers from asking about people's immigration status, Arizona requires them to, and the DPS allows them to without making it a requirement. There is plenty of disagreement about whether there's a difference between the policies at the Houston Police Department and the DPS. Going forward, Perry said, the law should allow officers to check the immigration status of people they encounter without requiring them to do so. Still, the budget and the significant biennial shortfall facing the state — $15 billion to $27 billion, depending on whom you listen to — appear to be the top item on his agenda. He repeated his campaign pledge of "no new taxes" and seemed to feel the same way about fees and other new revenues. He'll propose his own version of the budget between now and his State of the State speech in the first week of February. "I'll wait until [then]," he said, "and give you a little more expansive list of the issues that we're going to be focusing on during this next legislative session." And he's working Congress and his counterparts in other states about his view that the federal government is making it harder for the states to handle heir finances. "I had a conversation with Jerry Brown this week," Perry said. "I think Jerry Brown understands that he's got a real budget crisis on his hands. And I'm not sure anybody should paint him with a particular brush at this particular time. He's a thoughtful, wise fellow, and I've asked him to really look at some ways that we could, in a bipartisan way, go to Washington and say, 'Hey, listen, we need some flexibility in our Medicaid program.'" The governor doesn't think Washington would grant waivers or change its Medicaid program to allow states more latitude before Texas writes its next budget this spring: "I would be surprised, but that's not to say they can't." Senate Finance Chairman Steve Ogden, R-Bryan, recently floated the idea that because the state's business franchise tax isn't bringing in the revenue state lawmakers expected when they wrote it in 2006, it wouldn't violate any anti-tax pledge to fix it so that it does. House Appropriations Chairman Jim Pitts, R-Waxahachie, has said he considers that a tax increase. Perry apparently isn't a fan, either. "I'm not really into the area of raising more revenues," he said. "I think you grow yourself out of these situations like this. And the idea that somehow or another we can't reduce state spending, that's not alien to me. Matter of fact, that's what Texans are doing." He said every program in the budget is dear to someone, or it wouldn't be there. But he dismissed pleas for more spending, saying those are a regular feature of the budget process he's now watched for 25 years, whether there is a shortfall or a surplus. And things might improve before the budget is written, he said. "Hopefully, our budget numbers are going to progressively look better, even by the time May rolls around, we may have some continuing positive messages from our revenue sources," he said. "But if we don't, the worst thing we can do is put more burden on the families of this state and say, 'Hey, listen, we're just going to take more of what you got, because we're not tough enough to make these decisions to reduce spending.'"